High strength container lock & cargo door lock suitable for trucks and containers. High strength metal welding, thickness of steel 7mm resistant to bolt cutters. Special 7mm plate used for container locks. Made from high tensile spring steel, making it extremely difficult to saw through. Laser cut locking holes for accuracy. Specially bent lock claws engineered by suspension and spring makers. Baked and hardened at 1000 degrees Celsius and case hardened. Incredibly strong locking claws - bolt cutter proof. 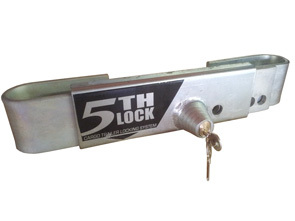 Due to flexible adjustments the 5th lock can be used on any cargo vehicle to shipping containers. 13mm locking shaft, easily replaced - if lost at low cost. Robust heavy duty structure - weighs 4.5 kilograms, extremely rigid. Clever locking system - uses union cylinder bolt sleeve. 2 keys per lock accommodate shipping seal in lock housing or insert large pad lock for extra security. Double locking system can lock most shipping container locks with lock rod distances between 340mm to 420mm. Suitable for all applications and industries - e.g. construction companies, government, container shipping companies, container manufacturers, transporters, freight companies, etc. Excellent value - no other lock compares - guaranteed. Locks rods doors from 230mm to 430mm apart. Electro-plated for extra durability. Reuse from one truck or container - fully transferable. Excellent investment in theft deterrence, reduce losses & break-ins during transit. 1 To 3 Working Days : These items are in stock in our own warehouse. Orders received before 2.00pm are dispatched the same day. 10 To 14 Days : These are mostly heavy items such as safes and filing cabinets that are shipped directly from our suppliers. We aim to deliver these items within two weeks from receipt of completed order. The delivery day will be booked in with you by phone by our carriers for these items. Orders requiring workshopping such as fitting non-standard locks to safes, cutting additional keys, keying alike or master keyed locks, or customised items may increase quoted lead times. PLEASE NOTE: Expected delivery dates or times given by Saunderson Security, our suppliers, or our carriers are given as a guide only. We cannot be held liable for any losses or costs incurred from delivery at a different date or time.